I'm sorry that I haven't posted lately. I've just been really busy (trying to find a full time job to go along with my current full time job). I'll be back to post soon. Don't forget about me. I weighed in yesterday morning and I was up another .4 pounds for the week. I was hoping for a loss, but I guess I can't complain since I started adding more carbs into my eating plan (I'm still not eating bread, potatoes or dessert). But I have added brown rice and beans, along with more veggies and fruit. I think by cutting stuff out for 2 months (especially empty calorie, energy sucking desserts), it's helped me to be more aware of portions and when to know if I'm hungry or not. I no longer over eat any one certain food group. When I eat something, it's just 1 serving and no more (which is plenty for me). I'm still loving Core! I've never felt better or more energized! I was abusing desserts something terrible a few months ago (because I had the points). Don't get me wrong, there's nothing wrong with the Flex plan, but when you're like me and abuse the crap out of how the points get spent each day, it's not really a healthy way of eating. With Core, I don't have to worry about points. I do use some of my flex points each week, but it's not on desserts. It's on things like bacon bits and lite laughing cow cheese for my omelet in the morning. Preheat oven to 350 degrees. In a large skillet, add the beef, onion, green pepper, and garlic. Cook over medium high heat until the meat is brown and the vegetables are tender. Stir in the chili powder, cumin, salt and pepper. Continue cooking for about a minute. Remove from heat and stir in the beans, rice, 3/4 cup of cheese, milk and egg substitute. Spray a 9x9 inch baking dish with non-stick cooking spray. Pour the beef mixture into the dish. Bake uncovered for 25 minutes or until liquid is no longer runny. Sprinkle the remaining 1/4 cup cheese on top as soon as you pull it out of the oven. Allow to cool slightly before serving. Serve with salsa and fat free sour cream if desired. In a small skillet, heat the oil over medium heat (just slightly under medium). 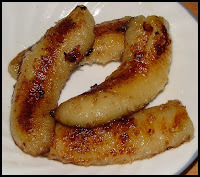 Cut the banana in half each way so that you end up with 4 pieces (or you can slice into rounds). Pick up the skillet and swirl the oil to evenly coat the pan. Add the banana. Sprinkle the top with cinnamon if desired. Cook on each side until browned (how brown you like it is up to you). Sprinkle with Splenda if desired. 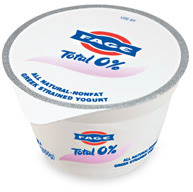 You can top with a little fat free cool whip if you like, but be sure to count the points. Per Serving: 193 Calories; 10g Fat (42.2% calories from fat); 1g Protein; 29g Carbohydrate; 3g Dietary Fiber; 0mg Cholesterol; 1mg Sodium. Exchanges: 2 Fruit; 2 Fat. Oh and I've now covered 23 miles of my 200 mile fat march challenge. 12 of those miles were today at the gym (2 miles on the treadmill and 10 miles on the stationary bike). I didn't really plan on riding the bike that long, but they had a good movie playing and I wanted to see how it ended. LOL! Food: I love most anything Mexican! 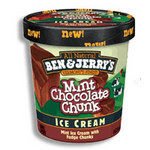 I also love ice cream, but Ben and Jerry's Mint Chocolate Chunk Ice Cream is awesome! Fruit: I'm not a huge fan of fruit, but when I do eat it, I like apples, grapes, strawberries and watermelon. I actually didn't like strawberries until just a couple of years ago, but now, give me some cut up with some Splenda and a little bit of fat free cool whip and I'm doing the happy dance. LOL! Celebrity/People: I like Ellen Degeneres. She seems like she'd be a really fun person to hang out with. Her humor seems to just come natural and I think that's cool. :) Drew Barrymore seems to have a good personality too. I also think Adam Sandler would be fun to hang out with. Event/Situation/Incident: Amusement parks are always fun. I like traveling (although I don't get to go often) because you get to see new things and meet new people. Music: This is another tough one. I'll just go with a general choice and say I like 80's music the most. :) I'm listening to flashbackradio.com right now. About Myself: I love that I can look at things with more than 1 perspective and then make a decision without jumping right in. I love that I work hard, I'm good at what I do and I love what I do (even thought it doesn't pay very well). I love that I don't take myself seriously too often and that I can make others laugh when they need it the most. I am now tagging: Anyone who would like to share a bit about what they love. I've gone to the gym two days in a row now (thanks to Linda convincing me to go). I have to admit, I don't want to go, and I procrastinate for a few hours before I decide I really should go. LOL! But once I'm there, it's not so bad and after I'm done, I'm glad I went. Yesterday I went and just walked 2 miles on the treadmill. Today I went with the intention of walking 3 miles on the treadmill (because I wanted to catch up with Linda who has already covered 8 miles and I was still at 5 miles). LOL! Anyway, I got there, hopped on the treadmill and began. I covered 1 mile with no problem, but when that 2nd mile rolled around, I thought I was going to die from boredom! If they hadn't been showing a movie at the same time, I might have been tempted to hop off. You have to understand, I'm not the type of person who really does traditional type exercises. I like to get outside and either hike, bike or Trikke. It's just too hot out to do that right now. If I have to exercise inside, it usually either involves Leslie Sansone's Walk Away The Pounds videos, or my Playstation 2 with DDR or Kinetics. So here I am, walking on the treadmill, glancing down at the distance button every 5 sections wishing it would hurry up. At one point I even increased the speed, but soon realized my feet couldn't keep up unless I wanted to jog (which I didn't and can't anyway). I kept going and trying to stay interested in the movie (it was an ok movie, nothing spectacular, but I didn't see it from the beginning either, so maybe I missed some really good parts. It was called Scoop). When I had almost completed 2 miles on the treadmill, the other two people working out in the room left, so it was just me. I thought, hmmm, maybe for the last mile I could try out the elliptical machine since nobody was in the room. As soon as the treadmill hit the 2 mile mark, I hopped off of it and found my way to the back of the room where the elliptical machines were (remember, the room is dark). I found the one I wanted (bumped my knee trying to get on it), and I lasted for about a minute. LOL! I felt like my legs were going to give out from under me and I didn't need anyone coming in and finding me on the floor. LOL! I thought, darn, well I don't want to get back on the treadmill! Then I figured, what the heck, I'll get on the bike, ride my last mile and then go home. After I figured out how to adjust the seat so my feet would reach the pedals (must have been a guy on it before me), I started off on my mile. I was surprised at how fast a mile went by on a bike (hey, it's been awhile since I've done this, so stop laughing). :) When the first mile was up, I thought, maybe I can do another mile. Then I did another. Before I knew it, I had done 4 miles. I was like, hey, I'm liking this. LOL! I was tired though and my legs felt like rubber, so I decided 4 miles was enough for the day (6 miles total with the walking). New people had come into the room when I was still on my first mile, so when I was ready to leave, I stood there for a minute and had some water to drink because I was afraid if I walked across the room, I'd either fall over, or I'd walk like I was drunk. LOL! I just walked slowly and made my way out. :) I'm hoping to have time to go back tomorrow, but I have plans later in the afternoon, so if I can't get there early, I'll have to skip tomorrow. Well, so far so good on the walking (for me). Last night around 10:00, I took my dog Riley for a walk around our apartment complex. We walked just over a mile total, which is 4 times around. It was hot, but not bad. The last time around, Riley must have had enough, because when he saw our door, he started pulling in that direction. I think he was afraid I was going to make him go around again. LOL! 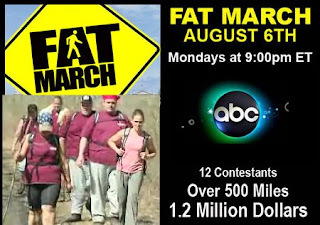 The TV Show called Fat March starts tonight on ABC. Will you be watching? I've got my DVR all set up to record it. :) These people are going to walk over 500 miles in just 10 weeks in an attempt to lose weight and earn money and other prizes. That's a lot of walking! I'm starting a new challenge kinda of based on the Fat March. I'm not looking to walk 500 miles in 10 weeks, but I want to set up my own challenge and change it up a bit. I want to strive for 100 miles in 10 weeks, but these miles can be not only walking, but anything like: jogging, bike riding, roller blading, golfing (walking the course, not riding in a cart), etc. Whatever you can do and still log your miles (other than driving or using motorized means of transportation), then it's allowed. I'll probably be doing a combination of walking and Trikking, and as Krissie mentioned in the comments, "Walk Away The Pounds" videos (since they're marked by the mile, they'll be easy to count). 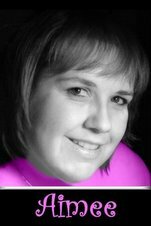 If you'd like to join in, come over to my message board and sign up (it's free). Then click on the "Challenges" link and post your info. If it's too hot outside to exercise, try exercising at night. If you can't exercise at night, exercise early in the morning. If those don't work, go to your local mall and walk around there in the air conditioning. Hit the treadmill, etc. There are always ways to do something if you really want to do it. This first one is called Walk Score. It tells you how walkable your area is. You can pick a destination and it will tell you how the path rates. Like lets say you want to walk from your house to the bank, or to the grocery store, etc. It lets you know how do-able it is. 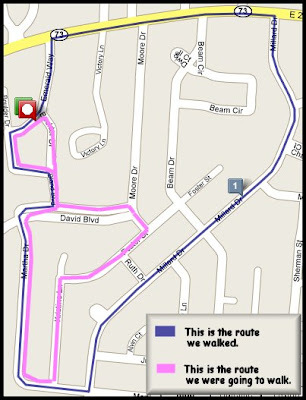 I checked some of the stuff around where I live, and it pretty much suggested that I should drive instead of walk. LOL! Rick and I stopped off to see the Vietnam Memorial Traveling Wall this morning (it's being displayed at a park here in Franklin for the weekend). The wall is an 80% size replica standing over 8’ tall, and over 370 feet long. I've never been to see the full sized wall in Washington D.C., so I thought it would be nice to stop and see the traveling wall. If you'd like to see how the wall is constructed, here is a video I found. With the addition of three names added in 2007 the total is now 58,256 names listed on the Memorial. 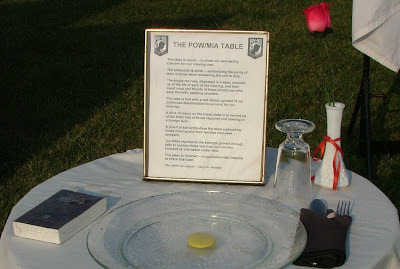 Approximately 1200 of these are listed as missing (MIA's, POW's, and others). Click on the image to read what the sign says. It's funny how when we're younger we see our adult lives being so much different than they are when it really happens (at least this is how it has been for me). Like for instance, when we were younger, Wendy and I had it all planned out that we would live next door to each other and we'd both have kids who were friends with each other. I'd be a music teacher and she'd be a chef (although I did take music in college for awhile and she has gone to culinary school). She was a much better cook than me and actually taught me how to make a cake from scratch when we were in high school. I can't really say that's what got me cooking though. LOL! Now here we are some 15-16 years later, we don't live next door to each other, don't have kids, she's a budget analyst (always working her way up the ladder... you go girl!) and well... you already know what I do. LOL! If anyone would have ever told me back then that this is how it would be now, I would have been like "shut up, nuh uh" LOL! Anyway, that's just something that I got to thinking about tonight. And although what I had planned out in my head many years ago didn't actually happen, I can honestly say I'm happy with what I do now. I'm not teaching kids how to play instruments, but I'm motivating people to lose weight and better their lives (hopefully that's what you get from my website anyway). LOL! I may not be able to predict the future, but I have hopes and dreams for the years to come. Even if those hopes and dreams don't turn out exactly the way I've envisioned them, I'm excited to follow the journey and see what happens. I'm curious... what did you see yourself doing as an adult when you were younger, and how does that compare to what your life is like now? Did it turn out the way you thought it would? I can't believe it's August already. Where does the time go? I think I'm still back in like March or April. Thank goodness for the calendar in front of me, or I'd be all messed up. LOL!